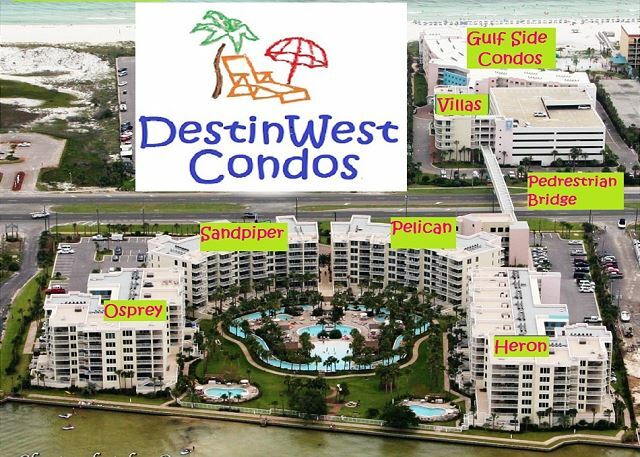 Destin West Gulf side 513--Under new ownership/management. Newly remodeled and updated. View of the ocean from this condo cannot be beat!! 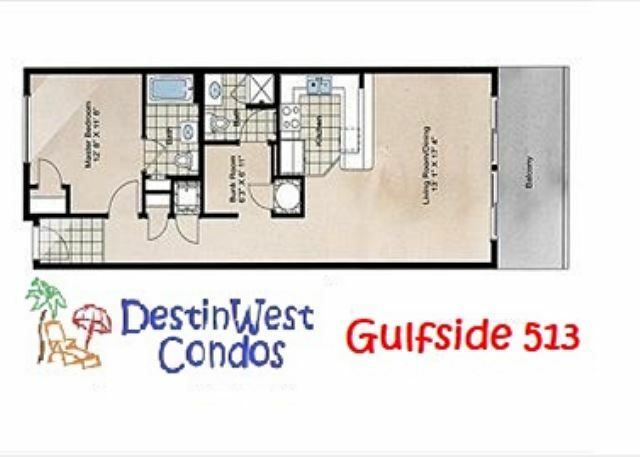 Gulf 513 is a sophisticated and stylish 1 bedroom plus bunk room condo that sleeps 6. 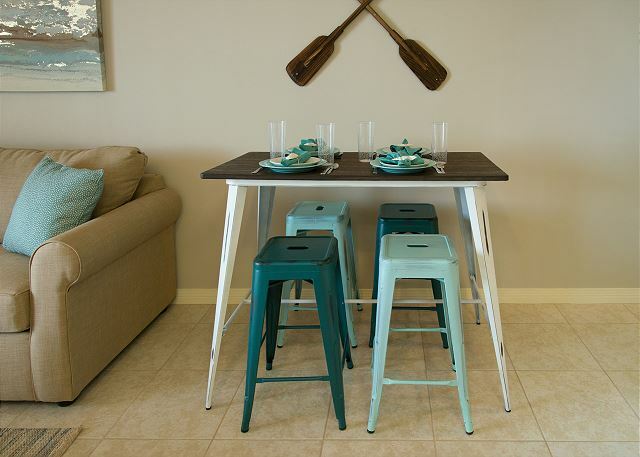 Located on the 5th floor of Destin West Gulf side, this newly renovated condo boasts of beautiful shades of blue that continue all throughout. Stunning views will have you thinking twice about ever returning home. 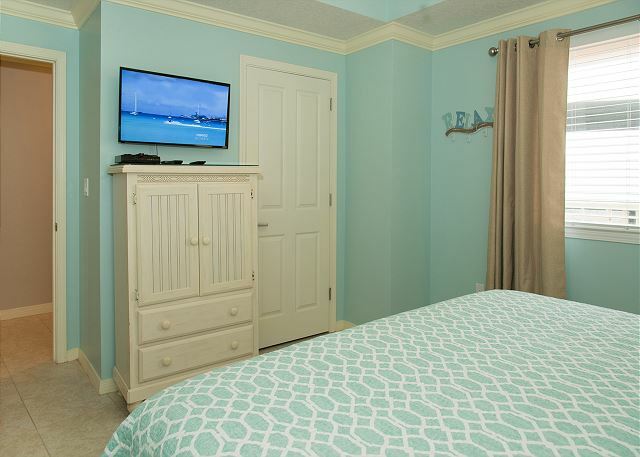 Spacious master bedroom features a king size bed, flat screen TV and a master bathroom. 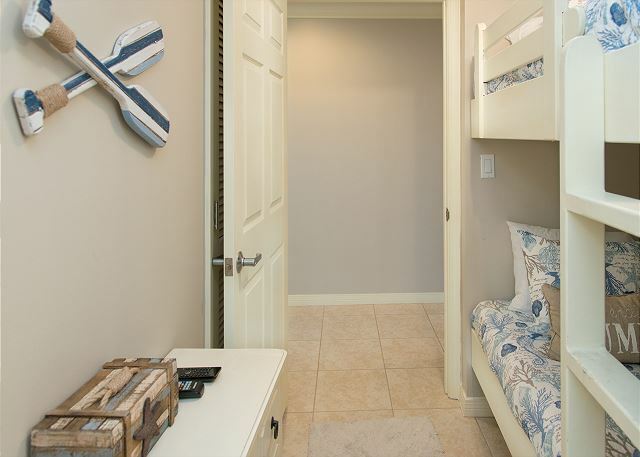 Bunk room is perfect for littles to adults and all of those in between and also has it's own bathroom. 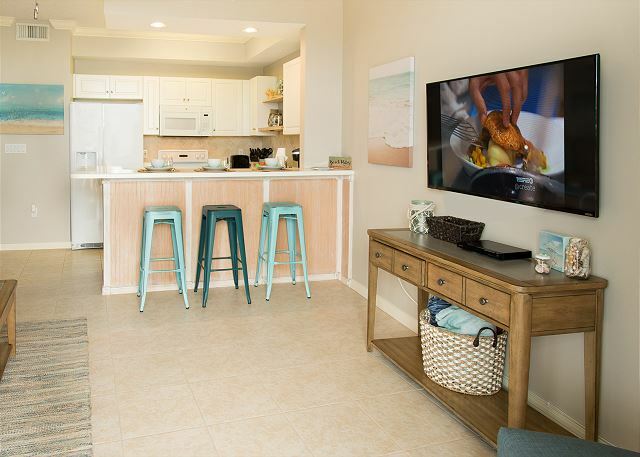 Open concept living/ktichen/dining room has plenty of seating to relax, enjoy the view or just kick back and watch a little TV after a long day at the beach. Sofa is a sleeper sofa. Dining table and additional seating at the kitchen bar will have you covered for a quick breakfast or a gourmet dinner. Kitchen is equipped with everything needed to cook a meal. The star of the show is the balcony though. With room for all of your guests to sit and relax or enjoy a meal....but who can resist a cup of coffee every morning with that view? 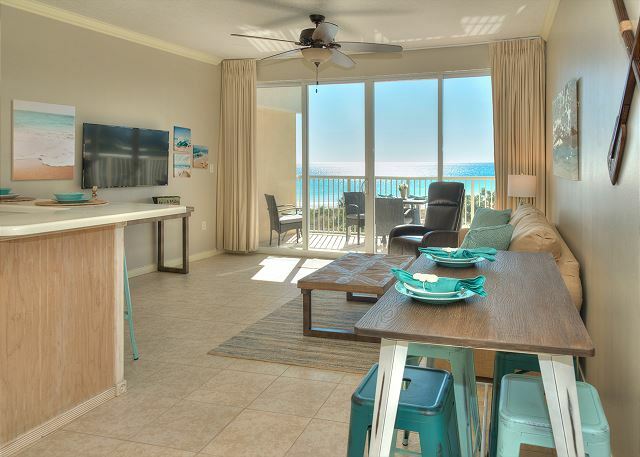 Beach access, 2 pools, picnic area with grills and a hot tub are some of the many things Destin West Gulfside offers, but that isn't all. 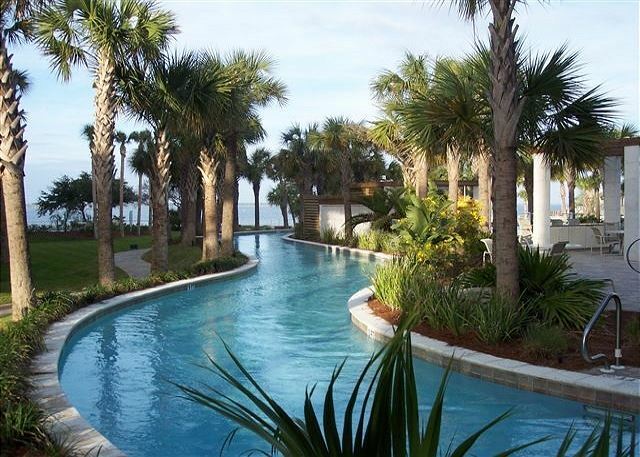 Guests have access to the Destin West bayside 700 foot lazy river, waterfall pool, marina and 2 large hot tubs. Be the first to enjoy this piece of Heaven on Earth. 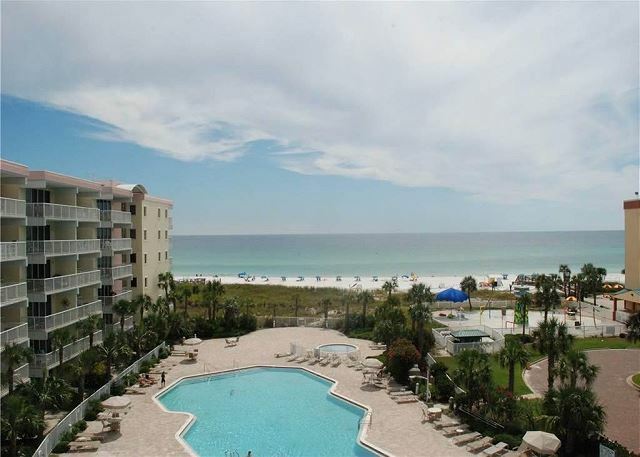 We love coming to Fort Walton Beach and we always stay on the beach side at Destin West Beach and Bay Resort. It was our first time staying in this particular condo and it was great! Beautiful view, clean, cute decor, and a perfect size for our family of 5. We would definitely stay here again. A few minor things: I do wish there would have been a guest book to sign to read comments,recommendations, etc. We all wish the larger pool and/or the lazy river would be heated for the spring time vacationers. There are other smaller heated pools and a few hot tubs, but those two pools are fun to use! They were just too chilly. We also would have liked to have had the nice, blue beach chairs and umbrella included in our rental. Overall, a relaxing, fun, and memorable vacation was had by all! 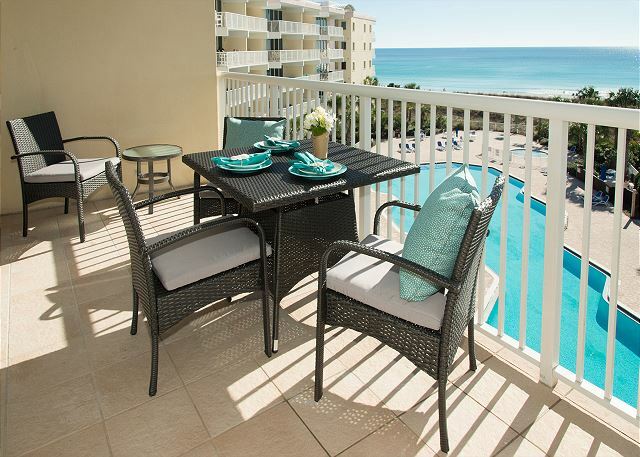 Dear Ms. Webster, Thank you so much for your excellent review of 513 Gulfside! We enjoy hearing from our guests and are so glad to know how much you enjoyed your stay! We'll look forward to having you back again soon! We loved the condo from the time we walked through the door! 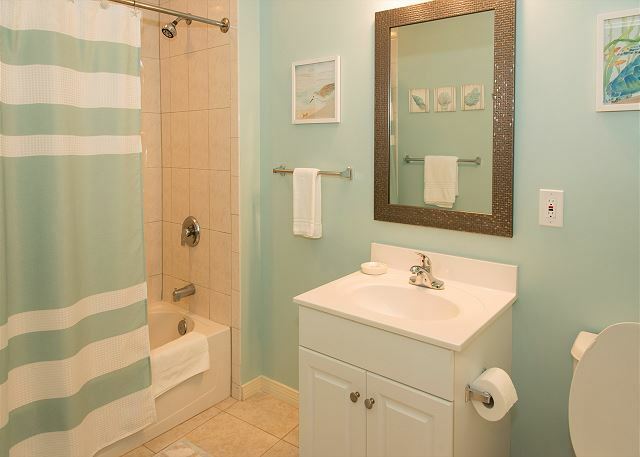 It was excatly what they described and was very clean! We can’t wait to go back again next year! 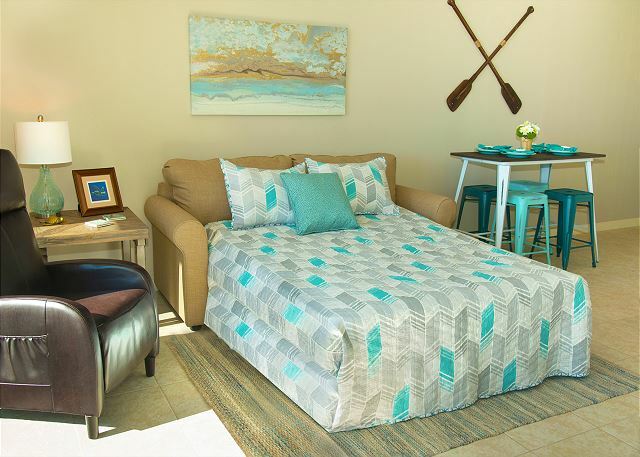 Dear Mr. Bonzelaar, Thank you so much for this excellent review of 513 Gulfside! We'll be looking for you next year and until then we'll save you some sunshine! Dear Ms. Hillyard, Thank you so much for this lovely review of 513 Gulfside. We're so pleased to know that you enjoyed your time with us, and appreciate letting your friends and family know about us! We hope that you'll be back to the area and will stay with us again in the future. 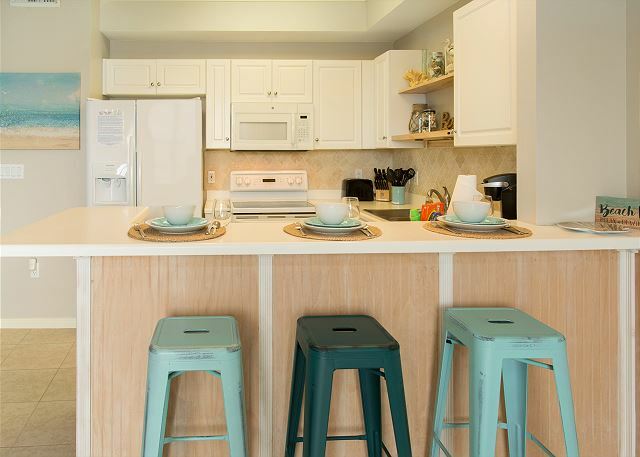 Nicely decorated, comfortable condo - well stocked kitchen, beach chairs, towels and toys. Heated pools are awesome. Beautiful view. Thank you for your kind words about our condo and the location as well as view. We are happy that you were pleased with all of the extras we placed in the condo that you could use. I am surprised by your rating for cleanliness though. This condo just went through a full week of deep clean right before your arrival. We've stopped by a few times during your stay to check on you and bring you an iron, but you never once mentioned anything about this and instead commented on how wonderful the condo was. I am wondering if you even rate the way you believe because this is the exact rating you gave us last year on a different condo. I am positive this condo was spotless upon your arrival though and will be with each guest that arrives as we thoroughly check after each of our housekeepers. We do hope to have you back as a return guest in the future, but would love it if you would address us with these issues as soon as they come up, so that (if needed) we can work to correct them immediately. We had a great time! The place was perfect! Dear Ms. Kressley, Thank you so much for taking the time to review us! 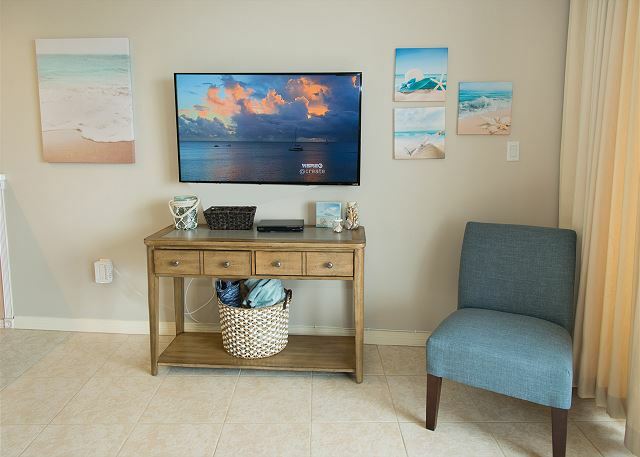 We'll be standing by to help you book your next trip whenever you're ready for more Florida sunshine! GREAT FAMILY VACATION SPOT!! Love this Condo!! •Did you have a good overall stay? We loved our vacation and this was the 2nd time we stayed in this specific unit this is decorated very beachy and provides a relaxing environment. I would highly recommend this unit. •Was the vacation rental in a great location? The unit was located high up so the views were great, you can see both the ocean and the pier from the unit and at night everything lights up really cool. The unit location is perfect the perfect distance from the pier, only a short walk on the beach to go to all the restaurants (10min max walk) . All the pools we had access to were awesome, it was like you are at an all inclusive hotel. •Was the home clean and in good shape? very clean and had all the kitchen pots and pan you would need to cook for a family. The beach wagon was in good shape too and included LOTs of pool toys for the kids to play with during our stay. •Was the vacation rental management staff helpful? We Did not need to interact with them. Dear Ms. Laub, Thank you so very much for taking the time to leave us this amazing review! We're in this business to please and love hearing when we get it right! We'll be looking forward to your next stay! The location is good, the unit is super nice, and the view is awesome! Dear Ms. Shumate, Thank you for your wonderful review! We love hearing from our guests and are so pleased to know that you enjoyed your stay. We'll be here to help you book your next trip! 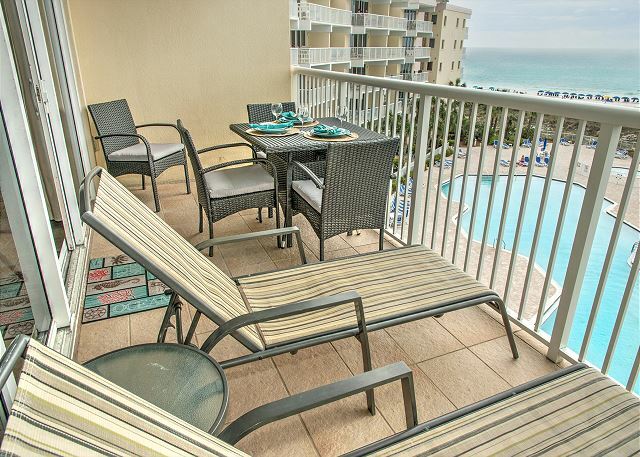 Dear Ms. Borres, We're so pleased to hear that you enjoyed your stay in 513 Gulfside! 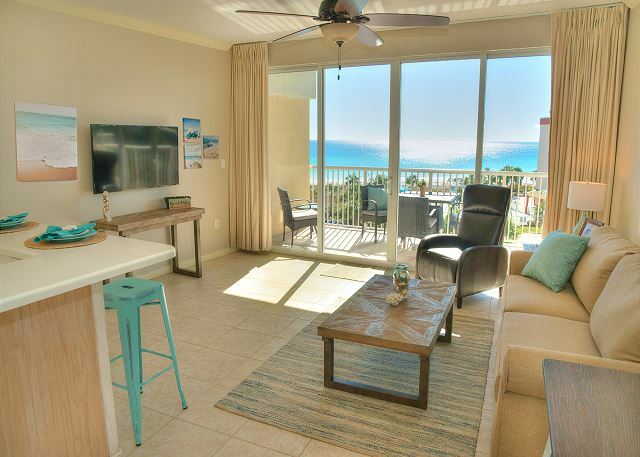 I love the views of the beach from this unit! We can't wait to have you back again and will be ready to help you in any way we can to book your next trip. 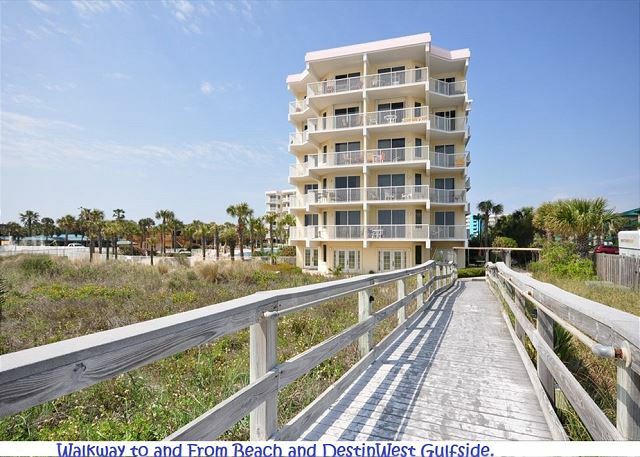 Perfect condo for our beach vacation! Set up and decorated nicely with everything we could need! Location is unbeatable! Dear Ms. Payne, Thank you for this great review! We love hearing from our guests! We'll be standing by to book your next trip whenever you're ready to come back! Destin West Resort was everything and more! 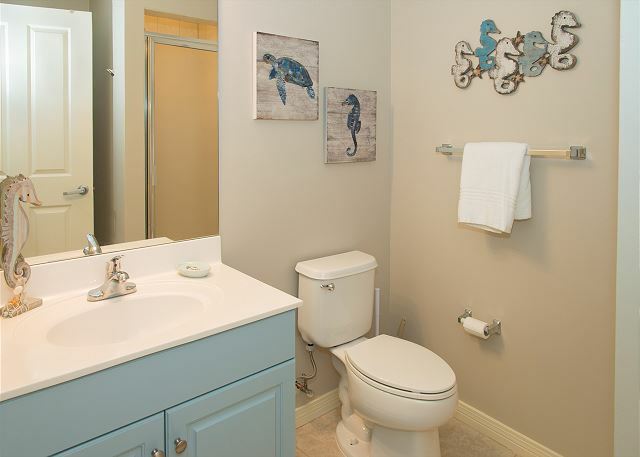 This was our first time using VRBO and we had a excellent experience. The condo was in excellent updated condition. The View of the Gulf was gorgeous right from the balcony. We loved having options. Short walk to the beach, multiple pools to chose from and restaurants and beach bar with walking distance. We look forward to returning someday! Dear Mr. Rolfert, Thank you for taking the time to leave us this wonderful review! 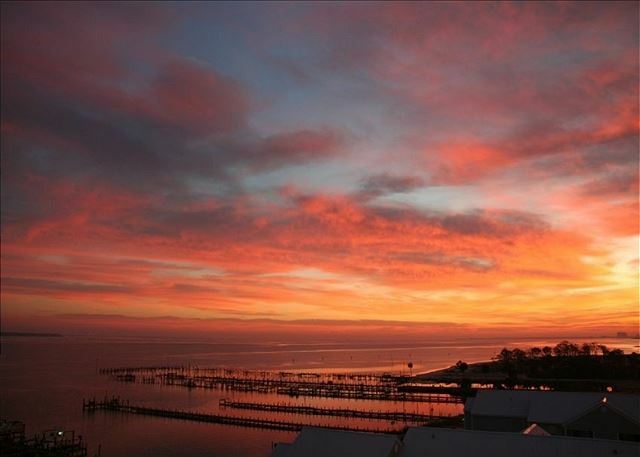 The view from 513 Gulfside is one of the prettiest on the Island! So glad to hear that you enjoyed the many amenities we offer here at Destin West. We hope you book with us again soon and will be standing by to help you with your reservation whenever you are ready! There are so many great things I have to say about Gulf 513! The view was STUNNING and the room was incredibly clean and well stocked. You open up the sliders and you can hear the waves crashing. We came with our 9 year old son who loved this resort!! Being able to choose from the various pools or lazy river kept him quite busy. The additional amenity of sharing the Ramada pools (and beach bar) was mint! 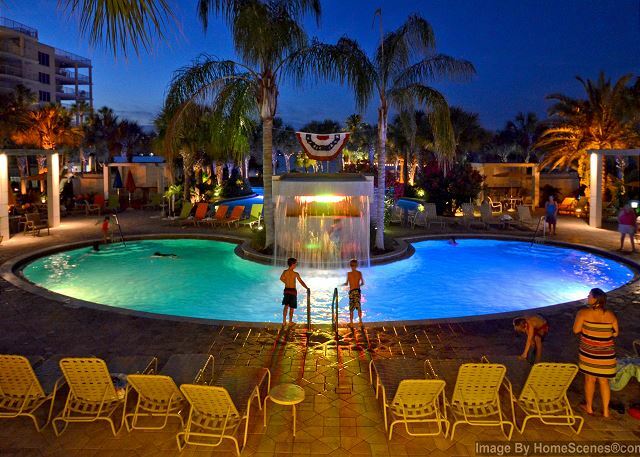 This resort is also great for little kids as well with a splash pad and shallow pool. 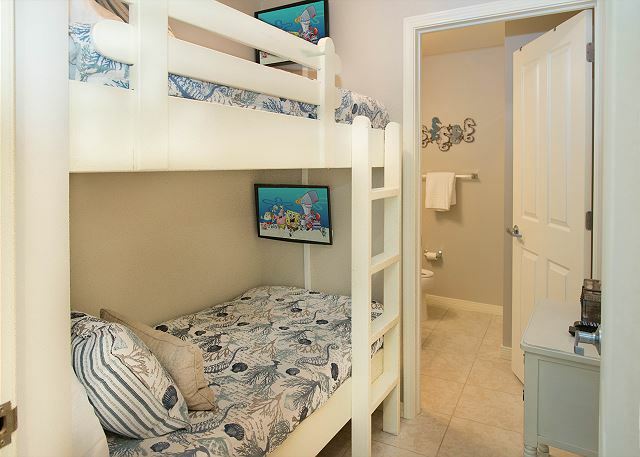 The condo was within walking distance of the pier and Boardwalk with a variety of restaurants to choose from along with fun night activities for adults and kids. This is why we are in this business! We love hearing about the good times had on vacations with familes! We'll be looking forward to your next visit!